Every artist has a bag of tricks to beautify, hide, embellish, highlight and create, what every time should be a masterpiece. I pulled out every single sleight of hand on this project. The Colton Dresser is for a "just-turned-5-year-old". The piece is certainly several heads taller than he is. His folks grew up in Pennsylvania and now reside near Cleveland. It was important to them that this heirloom dresser represent his interests, plus the legacy and culture that his parents will introduce to him as he ages. The inspiration for this dresser came from a Subway Art Dresser I refinished for my son, Paddy. Colton's dresser was a hand-me-down, and had sat unused in his room for a some time, waiting for ideas, (and a little height on his part). I am tall and it reaches my head. It had a few dings, some sticker glue, a drawer with a misplaced runner, and a door that was swollen from moisture and not quite plumb. Unfortunately, I am not a carpenter, but I have tools, so people are easily fooled. When I got it, this is what it looked like. Colton's mom had definite ideas about what would go on each drawer. She wanted me to use the Stealth Jet of Paddy's, but somehow incorporate his favorite color, green, hence the top, street name drawer. Next, He LOVES milk. I used the font from the "Got Milk" ads and modified a drawing and added texture on the glass so it would look as though it really contained milk. Colton's dad and family are hunters, so the turkey, deer and bear tracks, was the next drawer. I painted camouflage on it at first and was very proud of my work until I noticed I painted it on upside down. Strip and re-do, this time minus the camo. Notice the drawer track underneath with the animal tracks pointing down. It needed to be simpler, because the entire dresser was like a Las Vegas marquee, Where to look first? Colton is a big fan of Nintendo and the Super Mario Brothers, so those were the next two drawers. I wanted to use the original knobs and just pull a color that was used on the drawer front, and sometimes, I incorporated the knob into a letter of the word. That involved some creative math. Just so you know, my hand is not as steady as it once was, (another strip and re-do) so Mario and Luigi are Modge Podge'd on. Finally, the big blue B is the logo for Brunswick Schools. I chose the "B" over the actual mascot, The Blue Devils. Enough said. Colton's first and middle name were to be painted on the side of the dresser so it could be seen first thing when walking in his room. His birth year is on the bottom. Now for the door front. [Excuse me while I #*&^%$+@*%!] This was a son of a gun. Stacy wanted a map showing the distance between their Brunswick residence and the towns where the parents grew up. Originally, I was going to tea stain a map and call it good. But, it didn't seem right to put so much work into the rest of the dresser and skimp on the door. This was a major loss of sleep because when I go to bed with a conundrum, my eyes don't close, til a remedy in the form of a drawing is on paper. I wasted about 40 sheets of paper printing off and enlarging the route between the two cities and painting the turnpike roads, along with the Three Rivers. I dare you to find a map that shows the roads and the rivers. I superimposed and virtually guessed where they should go. Yahoo and Google couldn't agree, and they have more diplomas than I do. I did a bit of free sketch on the rivers, too bad my camera is in the same tech group as my flip phone. I do love the way the black (R--------m calls it grey) shows through the green when I sanded again. The secret is keep it smooth, use many coats, and STRONG magnets. Before I could actually return the dresser, I had to put some effort into fixing the door so it would close. The frame was out of square, so first I pounded on it so it would know I meant business. Then I removed the door, used a pliers and vise grip to straighten the bottom hinge which was bent in, and then mortised the wood so the hinges would lay flat to each other. Naturally, I couldn't find my good, new, never used wood chisel, so I marked it with a pencil, razor blade and did what your father told you never to do, "work in a small, confined area with a jig saw." On high. Whoa, that thing has some power. I played religious music and asked the 'Big Carpenter" to guide my hand so I could do it in 'one take'. After sanding the crap out of every edge that would touch, and in a confident moment, screwed the door back on. Success. Touch up painting everywhere, some more Howard's in any dull spot, plus my go to, Wipe on Poly. DONE. This is the side of the dresser no one sees. If I were looking to put more frosting on it, I would suggest painting a measuring rule on this side. The magnets were pretty cool to work on. [Hmmm I think Ohio is upside down, is that significant?] Last St. Patrick's Day I made and painted little Irish flags on small pieces of wood, poly'd and pinned them. I used that same idea, but cut out logos that I found on the internet, sealed them and added magnets. The magnets can be moved anywhere on the door and perhaps, even to the right location. [Side note: I had done 2 more magnets, one of the Steelers, and one of Heinz Field. They are no where to be found.] A friend came over yesterday while I was working on them and picked up the Steelers magnet, and said, "You can throw this one away." Everyone knows there is a deep rivalry between the Browns and our neighbors to the East, but purloin the magnets???? My house is almost 200 years old, maybe there is a Halloween ghost somewhere bent on "steeling" it. *UPDATE* After an exhausting search-the magnets have been found. They were under a weight so the magnets would dry level. They have not been dusted for prints. 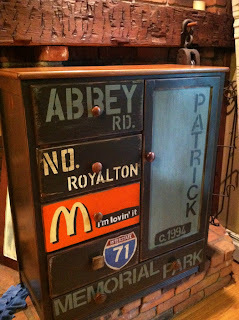 I am very happy to send Colton's Subway Art Dresser home. It was a pleasure creating it. This post was linked to Miss Mustard Seed's furniture feature friday. WOW! I applaud you on the amount of work you invested in this piece. I would treasure this piece forever! Thanks, Donna, I appreciate the love.